by MarkLives (@marklives) Instead of looking back at Net#work BBDO’s last 23-odd years, Mike Schalit, founding partner and CCO, thought it’d be more instructive to look forward and see what wisdom could be identified on what does it really take to direct creativity. The result? The Creative#Director (C#D) coffee table book, curated by Schalit and designed by Emma Strydom. Over several weeks, MarkLives is featuring the pearls of wisdom from five of the 30 participants — next up is Neo Mashigo. 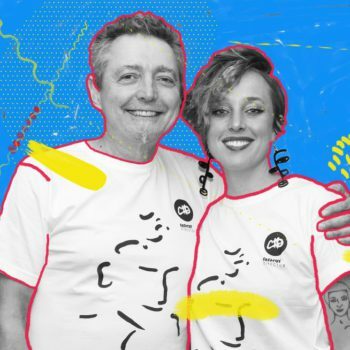 In order to create C#D, Schalit approached as many creatives as possible who’d passed through the agency’s doors since its birth, in May 1994, as the very first agency in the new South Africa, and posed six basic questions. As with most things in life, it requires a chakalaka of traits to be a CD. First, you have to be a creative. This might seem obvious. Yet there are many people out there walking the walk of a CD without having gone through the fire of a creative department baptism. And until that happens, you know nothing, John Snow! You need to display leadership qualities. People should feel happy to receive your leadership and guidance. Note: this could require a little muti. Being a talented creative helps. However, being able to extract the best out of a team of people is paramount. You should be curious; your interests should be broad, as your world will be a collision of countless different spheres, even that which you hate. And, so, you need to be willing to learn, to listen, to observe and sometimes, endure. Generally, the people around you are good teachers — meaning the teller at Pick n Pay, your family WhatsApp group and the friend who sends you chain prayers. It’s the people who aren’t wearing the creative crown who are the people you should be listening to carefully. An innate understanding of people allows you to work your way around those who stand in the way of your creativity before they “make the thing that makes the pots not to be done”. You need to be able to step back and be willing to allow others to take the wheel when an idea is being improved upon. Ultimately, I don’t think being a CD is something that you decide upon and pursue; it is something that finds you and chooses you. Mike Schalit: Major achievements at Net#work and thereafter? Neo Mashigo: While I was at Net#work, I came up with the idea of selling prepaid airtime for R5 when the going rate was R29,and this was a business big idea based on an observation from street hawkers. So the street hawkers would buy a 20-pack of cigarettes and then sell single cigarettes because people could afford to buy singles many times rather than a pack. So I took this idea to cellphone networks and gave Cell C a big competitive advantage that changed the prepaid market for good. This idea worked both for the brand and the consumer. MS: Best piece(s) of work at Net#work that made you proudest? NM: June 16 Metro FM poster. MS: Most spectacular failure at Net#work? NM: Failing to sell an idea we had that won Grand Prix three years down the line. MS: Most-significant work/achievement post Net#work? NM: TIA campaign for DStv Africa and winning a Loeries Grand Prix and Cannes Lion Grand Prix for Lucozade at Ogilvy. MS: Crazy idea that we as a C#D collective could collaborate on to make a dent in the universe? NM: We could do a campaign that would lead to a subject at school level which encourages pupils to think creatively and make creativity a normal thing, not a thing that weirdos do. Another one is a campaign for South Africans to learn one additional local language so that we can speak to each other’s hearts. This is not just white people learning local languages; this is everyone learning an additional one. NM: “One who sows the seed will not enjoy the shade. The one generation sows the seed, another waters the seed, another prunes, another enjoys the shade. It is an intergenerational sacrifice.” —Unknown. In order to inspire the next generation of creative leaders in South Africa, Net#work BBDO has published the Creative#Director (C#D) book — insights into the creative process by 30 of South Africa’s top creative leaders. Beautifully crafted and designed by Emma Strydom, produced by Clinton Mitri and Exhibit Print in the finest of glossy coffee-table book traditions, it’s a riot of provocation and inspiration, edited and curated by Mike Schalit, Net#work BBDO founding partner and CCO, from the responses of 30 creative directors to a few leading questions. A finer gang of rogues you’ll be hard-pressed to find — they’ve made the Net#work journey infinitely more madcap and magical, building and reinventing brands along the way, and making a difference to bottom lines and society. Some have gone on to become CDs in their own right; some have formed their own agencies; some have simply found themselves; and some are still with the agency today. All proceeds from the special limited-edition book, which costs R995, go towards helping build a library in a disadvantaged community. Donations for the library initiative may also be pledged.